Kohli on Thursday reiterated that Dhoni remains an integral part of the Indian limited-overs set-up. When MS Dhoni was omitted from India’s T20 squads against West Indies and Australia, many believed it was the beginning of the end of the road for one of India’s most decorated captains. The selection committee decided not to include Dhoni for six T20Is – three against West Indies and another three against Australia, implying that the World Cup winning captain was indeed dropped for the first time in his 14-year-long career. 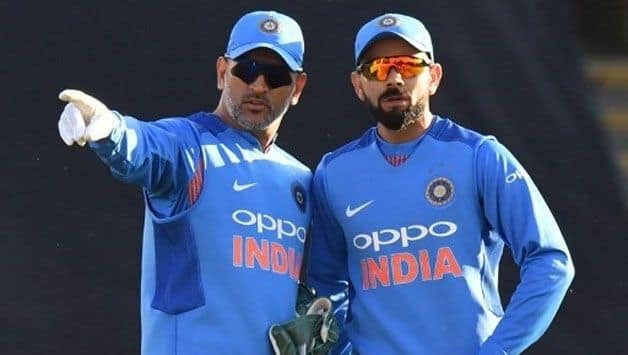 However, Virat Kohli on Thursday reiterated that Dhoni remains an integral part of the Indian limited-overs set-up and that the wicketkeeper batsman decided not to play in the next six T20Is so that young Rishabh Pant more limited-overs exposure. Pant, 20, has shown tremendous promise since making his Test debut in England and is touted to become India’s go-to man behind the stumps once Dhoni is done with his career. “I think the selectors have already addressed this if I’m not wrong. And he’s been spoken to, firstly… So, I don’t see any reason why I should be sitting here and explaining that. I think the selectors have come out and explained exactly what happened,” said Kohli. “I was not part of that conversation so… It is what the selectors explained. I think people are putting too much variables into the situation, which is not the case I can assure you of that. He’s still a very integral part of this team and he just feels that in the T20 format, someone like Rishabh can get more chances. 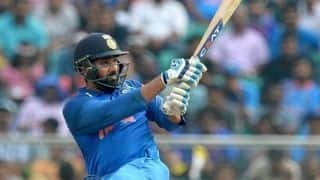 Following India’s thumping nine-wicket win over West Indies on Thursday that led them to a series win, India captain Virat Kohli mentioned that the performance of Ambati Rayudu and Khaleel Ahmed was India’s biggest takeaway. However, despite winning the series 3-1, Kohli pointed out that India still have some work to do as a fielding unit in order to enter the World Cup fully prepared. “Those two things is something that we were looking for a while; someone to back-up Bhuvi and Bumrah – someone to pick up wickets and bowl in good areas. Having a left-arm seamer gives you variation in the attack. Khaleel was really good and Rayudu of course grabbing his opportunities, batting with maturity, batting with composure. It is always good to plug in the areas that you are looking at,” the India captain added. 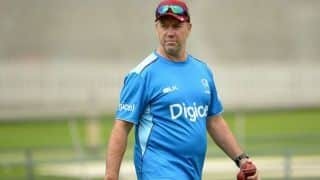 “If we can be consistent as a fielding side, it can give us more consistency overall in our skills department as well. In the field, we can still improve a lot. We have spoken to the people in the practice sessions who need to do the extra effort to sharpen their fielding, and they are putting in that extra effort. Kohli has time and again stressed on how important it is for the team to possess balance. India are yet to finalise a core team combination and the allrounder slot is where the equation becomes all the more tricky. India’s No. 1 allrounder Hardik Pandya is out injured and in his absence Ravindra Jadeja has made the most of his opportunities. It was his 4 for 34 that bowled West Indies out for 104 and Kohli admitted that Jadeja has indeed produced a strong case for himself. “It depends. When Hardik (Pandya) is fit and fine to play, you have to see what is the combination you have to take in the World Cup. If Hardik is fit, Kedar becomes a spin option as well. Hardik becoming fit also gives you four seaming options, along with Kedar and one more spinner. You might need one more spin option. Jadeja becomes the key there with the team balance,” Kohli said.